The first step to reducing mosquito problems is to understand their lifecycles and habitat needs. Mosquito lifecycles and habitats can vary among species. However, all mosquitoes require water to complete their lifecycle. Female mosquitoes require a meal of blood to produce eggs, which may be laid directly on the water’s surface or on moist soil adjacent to water, depending on the kind of mosquito. 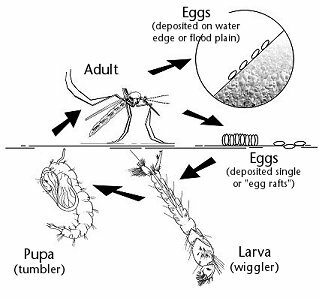 Mosquito larvae (called wigglers) suspend themselves in shallow water and filter the water to feed on organic debris. The larvae pupate into tumblers and then emerge as adults. This lifecycle can happen rapidly, as short as seven days. Eliminating or managing standing water around your house is the best method to prevent mosquitoes from breeding in your backyard. The following guidelines will help you identify potential problem areas around your yard. Properly recycle or dispose of cans, plastic and ceramic pots or other water-trapping containers. Recycle old tires; contact your local solid waste management facility. Store un-mounted tires so that they don’t collect rainwater. Place tight covers or screens over cisterns, fire barrels, rain barrels, tubs, septic tanks and other water collectors. Change birdbath water every week (more frequently during summer). Drill drainage holes in planters, boxes and tires left or used outdoors. Regularly drain pet dishes and plant pot saucers. Empty uncovered rain barrels every week (more frequently during summer). Regularly clean and repair gutters to prevent them from retaining water. Regularly check and drain plastic covers and tarps used outside such as pool covers, Jacuzzi covers, garbage can lids, compost covers and gardening tarps. Store water-trapping containers such as wading pools, wheelbarrows and buckets upside down or inside shelters. Fill in tree holes with sand or mortar, or develop drain-holes so water cannot accumulate. Fill or drain seepage ponds and puddles. Grade or fill low areas to prevent standing water. Check and repair leaky irrigation systems, pipes and faucets. To avoid puddles, do not over-water your lawn and garden. Manage weeds; keep vegetation short around water. Adult mosquitoes are attracted to dense, tall vegetation around water. Remove unnecessary floating structures or debris from ponds. Mosquitoes are often found around floating debris. Keep drains, ditches and culverts clean to allow proper drainage. Consider stocking ornamental or permanent, self-contained ponds with insect-eating fish, such as goldfish. Shape pond edges to a shelf or steep slope. Mosquitoes prefer shallow pond edges. Using insecticides to kill mosquito larva around the home and yard is not recommended as the only control method. Due to concerns about pesticide contamination of surface water, many restrictions apply in Washington State. According to current Washington state law, only a few pesticides are available for use in contained water bodies by homeowners without a Washington State Department of Agriculture pesticide license. Individual landowner insecticide management of mosquitoes is rarely effective; management for mosquitoes is best achieved as a regional/municipal effort. Contact your local government for mosquito abatement information. Consult WSU Pest Leaflet Series "Pest Management for Prevention and Control of Mosquitoes" PLS 121 (http://pep.wsu.edu/pdf/PLS121mosquito.pdf) for more information. For more information contact your local extension office. Contact us: e-mail | 360-676-6736 | Office Hours M-F 8:30 a.m. to 4:30 p.m.